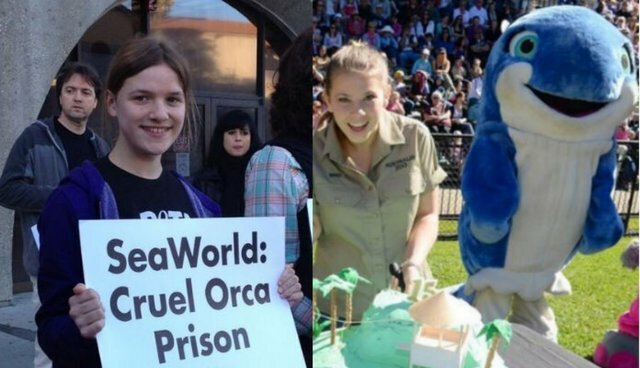 Bindi Irwin is only a few years older than I am, but we are worlds apart on our views about cramming orcas and dolphins into SeaWorld's floating prison cells. I went to jail after jumping in front of SeaWorld's Rose Parade float to protest the amusement park's cruelty to orcas and dolphins. Bindi jumped at the chance to be SeaWorld's new "ambassador" because, well, I'm not sure why. As someone who lost a parent at a young age, Bindi seems like the last person who would be a spokesperson for SeaWorld, knowing that it has taken baby orcas away from their loving moms, leaving them thrashing and wailing with grief. Wild orcas never permanently leave their moms and pods. Please, Bindi, you should know how awful it is for SeaWorld to separate mothers and children, which it does all the time. Orcas and dolphins in the wild have the whole ocean to swim in, and they have dozens of friends and family members who love them. They are super-smart animals who work together as a team, talk to each other using special dialects, and swim for many, many miles every day, enjoying the currents and the sights of the sea. At SeaWorld, all of this is taken away. Their world is shrunk from square miles to square feet. Intelligent orcas with individual personalities are reduced to cartoon "Shamus." And how many audience members realize that every single orca performer, male or female, in SeaWorld's parks is called "Shamu"?! Swimming in circles in SeaWorld's fish bowls makes orcas and dolphins crazed, frustrated, and angry. Who wouldn't feel the same way if they were kidnapped, imprisoned in a tiny tank, and forced to perform silly tricks on command? There is nothing that SeaWorld can do and no one it can hire who can erase the truth that those of us who saw "Blackfish" know. Customers are running away from SeaWorld! Ticket sales are down, musicians are canceling shows, and schools are canceling field trips. SeaWorld can never make up for the lives it has destroyed. The only thing that it can do now is stop hurting more animals and release the orcas it has to coastal sanctuaries. Recently, California state lawmaker Richard Bloom introduced a bill that would force SeaWorld to do the right thing by making it illegal for SeaWorld San Diego to hold orcas in captivity. I wish I lived in California, because I would like to walk right up to Mr. Bloom and give him a big hug. It makes me sad that instead of working to free orcas -- to have them live in the great oceans again -- Bindi Irwin is using her name to help keep them in small, barren tanks. We don't want to see orcas and dolphins turned into circus clowns. Animals are so much better than that. We should be, too.